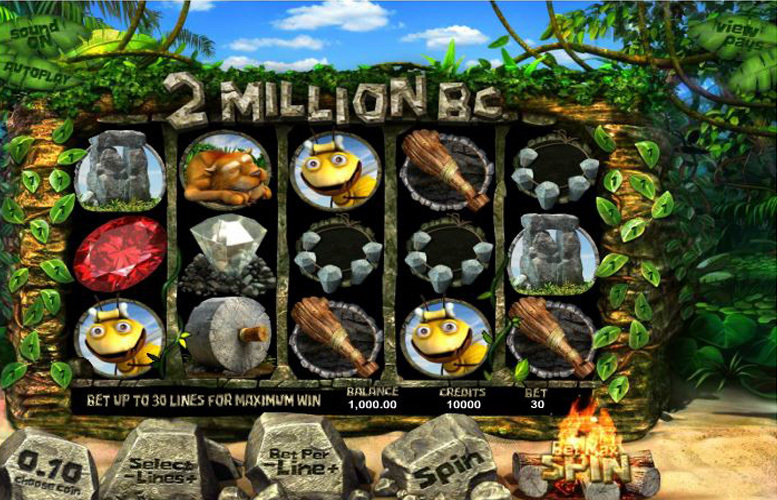 Betsoft have created an amusing game with 2 Million B.C. It’s a fun title that starts with a dramatic cutscene with characters that appear to have been heavily influenced by the hit movie Ice Age. The slot’s main protagonist is a caveman whose love interest has a penchant for sparkly things. With that in mind, he seeks to steal a diamond from a sabretooth tiger. Presumably this display of heroism will land him in her good books as well as earning a substantial pay-out for the player. The game has great animation throughout, some enjoyable bonus features, and is overall an enjoyable experience. There are a few drawbacks, however. These include the generally low average (return-to-player) RTP rating, as well as the minute upper betting limit. Great look and feel. The cinematic intro, sound effects, symbol design, and animations throughout combine to give a title with real character. Multiple enjoyable bonus features. There’s a lot of diversity within 2 Million BC and this gives it strong replay value. Very low top betting limit. Many players will be more than happy with the £150 per spin maximum bet. However, the highest rollers will be better served elsewhere. Low RTP rating of around 91%. When compared with machines that offer 97%, some players might find this unacceptable. Cavewoman = 2500x the line bet. Sabre tooth tiger = 2,000x the line bet. Bee = 1,500x the line bet. Stone Henge = 1,250x the line bet. Wheel = 1,000x the line bet. Club = 750x the line bet. Landing three or more campfire symbols simultaneously will earn players free spins. Additional free spins can be triggered during this mode too. 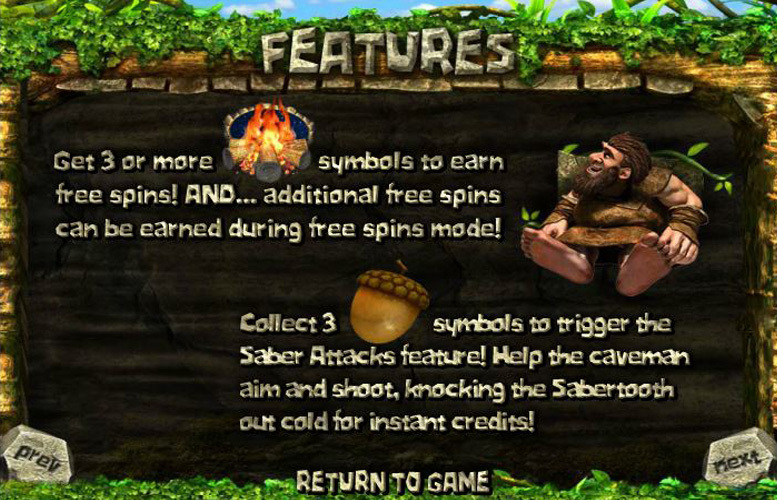 Players who collect three acorn symbols will trigger the Sabre Attacks feature. They must help the caveman aim and shoot to knock the sabretooth tiger out cold. This awards instant cash prizes. The Diamond Bonus award is multiplied by credits played on that line. Players who hit three or more Diamond symbols in a winning combination on any active pay line will unlock the Diamond Bonus. 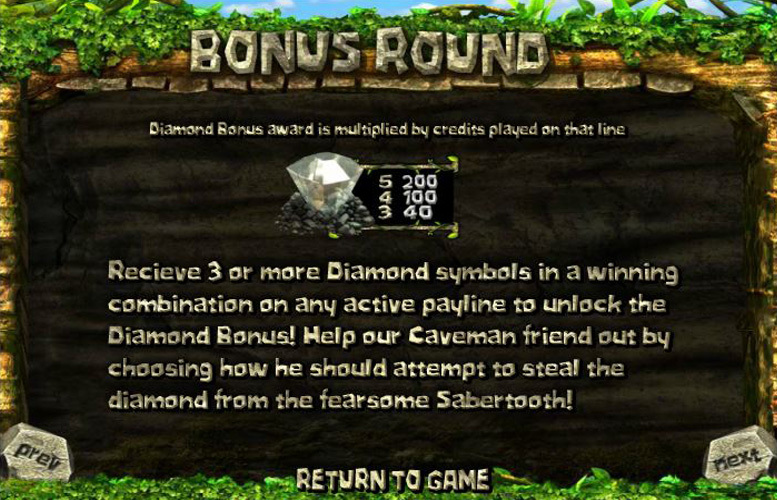 They must then help the caveman by choosing how he should attempt to steal the diamond from the fearsome sabretooth. Stone circle = 625x the line bet. Cave painting = 500x the line bet. Urn = 375x the line bet. Ruby = 250x the line bet. Players are given ultimate control over how they distribute their bets on 2 Million B.C. 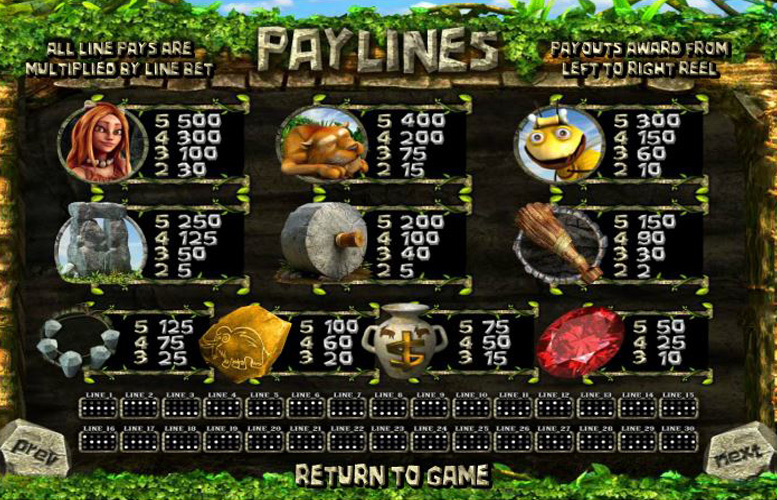 They can adjust the amount of lines they play across (between one and 30), as well the number coins bet per line (between one and five). They can also adjust the value of each coin played too. The lowest is just 2p, and the highest is £1. With all these values set to the minimum, the lowest cost per spin is 2p, and the highest is £150. Whilst this is certainly adequate for most players, there will be some out there who will find the upper betting limit to be too restrictive. They’re better advised to check out other machines. 2 Million B.C. is a game with great character. Thanks to its strong art style, as well as its superb use of animations throughout, the game has a very modern feel – despite its ancient theme. It’s a fun, bright, amusing title, and owing to some thoughtful bonuses, it can be a highly lucrative one if you’re having a lucky day. Unfortunately, thanks to the rather low RTP running good will happen slightly less often than it does on many titles, and this is certainly to the game’s detriment. It’s also not one for the highest rollers since the maximum bet possible is just £150 per spin. This game has a rating of 4 / 5 with 792 total reviews by the users.